Those of us who are used to the high standard of electricity utility supplies in the industrialised world sometimes forget the problems faced by users of high tech equipment in the third world. This page describes a strategy for planning electrical power protection in a small business or professional office application. These notes may also be helpful to householders facing regular damage to electrical equipment - even just ordinary light bulbs. These fall into different categories the critical load must be protected from one or more of the following: out of tolerance voltages (sags surges and brownouts) spikes on the line and/or keep working when out of tolerance voltages occur mains supply fails. Most electrical equipment is able to function normally if the voltage varies by less than +/- 10%. Modern equipment is also usually able to operate satisfactorily in an environment where small noise spikes (less than 100V) arrive down the line. However the data handled in modern digital equipment is sometimes corrupted by severe spikes. Some of the equipment may be so critical that it needs protection from both noise spikes and power failure. Other equipment may need protection from brownouts and/or very high voltages. A thorough survey of the various equipment loads around the business or office location should be prepared. Each equipment needs to be classified. For example - critical essential non-essential. The actual load of each item needs to be expressed in watts. It is often misleading to take electrical ratings from external labels on the equipment to be protected. Fuse ratings can also be much higher than actual consumption and should only be used as a guide where no measuring equipment is available. Separate lists need to be made for the various loads showing which ones are critical and others which just need protection. Consideration should be given to the possible need for a few lights to be supported when the mains fails so that critical equipment (keyboards!) can actually be seen. Attention needs to be paid to the problems of separating the various electrical wiring circuits. It also makes sense to adopt some procedure for ensuring that the load is not used on the wrong supply. Typical approaches include labelling or the use of different style plugs and sockets. For some systems permanent wiring is sometimes an alternate solution. For more information or assistance in preparing a strategy please ask our sales office. Those of us who are used to the high standard of electricity utility supplies in the industrialised world sometimes forget the problems faced by users of high tech equipment in the third world. This page describes how the World Health Organisation addresses the problems associated with protecting the compressor motors on refrigerators. The reliability of the electricity supply is a key issue when choosing refrigeration equipment. Where power cuts exceed 8 hours in 24 hours the use of ice-lined refrigerators and freezers is essential. No refrigeration equipment currently available has a holdover time greater than 2.5 days. Vaccine will be destroyed if there is an extended mains power failure unless there is an alternative source of power. It is essential to assess the risk of such failure. Failures may arise for many reasons. Examples include overloading of the power supply network; mechanical breakdown; lack of fuel or seasonal storms. Replacing large quantities of damaged vaccine is expensive and extremely disruptive. It may not be possible to replace vaccines quickly because world stocks are limited. Emergency replacement from a finite world stock also disrupts the supply of vaccine to other countries. All sites stoning large quantities of vaccine should have a standby power supply. Often this is achieved most economically by locating the vaccine store in a hospital compound or on some other site which already has a standby generator. When this is not possible it may be necessary to install a generator to serve the vaccine store alone. The Product Information Sheets give advice on choosing and buying a generator and the EPI Equipment Performance Specifications provide detailed specifications. Wherever possible the final sizing of generators should be made the responsibility of the cold chain equipment supplier. Generators serving vaccine stores only should be fitted with automatic starting devices linked into the cold room or refrigerator/freezer alarm system. If the vaccine store is served by a compound generator this will generally be started by an automatic mains failure device. In such cases alarm-triggered start-up is not required. All generators should be run at least once per week and should be regularly serviced to ensure that they remain operational. The fuel tank should be kept full at all times. A generator should be sited so that it does not create a fire hazard. Typically it should be located in a separate building or weatherproof enclosure. The fuel tank should be isolated and should be surrounded by a low wall or an earth bank to prevent fuel spills from spreading. Both the generator and the fuel tank should be located in a secure compound to prevent theft. The fuel filler cap tank should be locked and the fuel line should be protected so that it cannot be tampered with. Fire extinguishers capable of extinguishing fuel oil engine and electrical fires should be fitted dose to the generator and fuel tank. Fuel supply for the generator must be a priority allocation. A running log should be kept in order to monitor fuel consumption. In many countries severe voltage fluctuations occur in the mains power supply. Voltage fluctuations greater than 15% will damage compressor motors. The problem can be overcome by fitting each piece of refrigeration equipment with a voltage stabiliser. Some of the refrigerators and freezers in the Product Information Sheets are supplied with integral voltage stabilisers. We are grateful to the WHO for the opportunity to reproduce their recommendations. There are several different types of refrigeration systems (refrigerators, freezers and chillers etc.) available for medical applications, such as vaccine, blood and tissue sample storage. Uses a motor to compress the vapour refrigerant. Requires a reliable electricity supply to provide precise and stable temperature control. The most reliable, durable and easiest to maintain. Uses heat transfer to compress the refrigerant. Requires stable electricity supply, bottled gas or solar thermal for the heat absorption system. May require users attention at least twice daily to maintain precise and stable temperatures. The unit takes much longer to produce the desired temperature change. 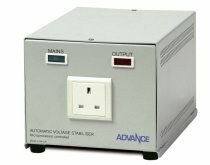 AUTOMATIC VOLTAGE STABILISER is recommended to maintain the accurate temperatures necessary for medical applications. Successfully runs both COMPRESSION and ABSORPTION type units. The wattage rating of the AVS must be (typically 50%) greater than the rating of the refrigeration unit. This is due to the very low power factor of vapour compression refrigerators. Successfully runs the COMPRESSION and ABSORPTION type units. When running an Absorption unit the wattage rating of the AGT must be (typically 50%) greater than the unit rating. When running a Compression unit however, the AGT must be rated typically 10 Times greater than the unit rating. The rating is so high to overcome the High Inrush Current of the 'Motor' on Start Up and to prevent stalling at low input voltages.